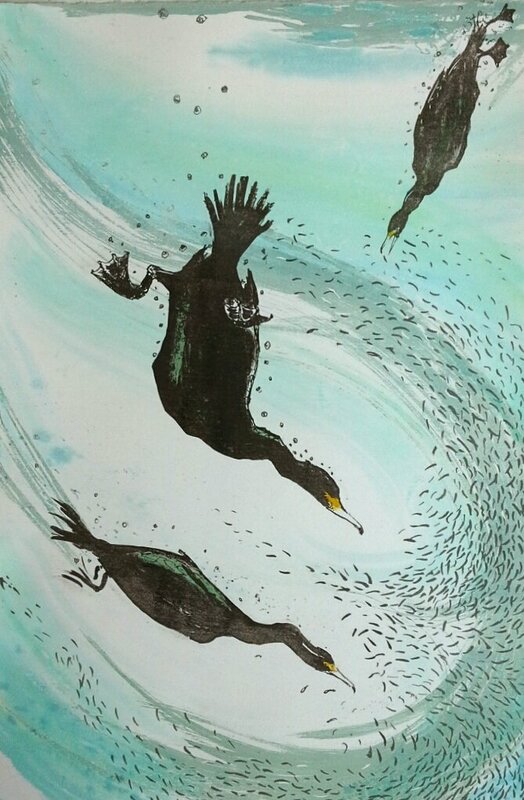 Louise Scammell is a printmaker based in South Devon. 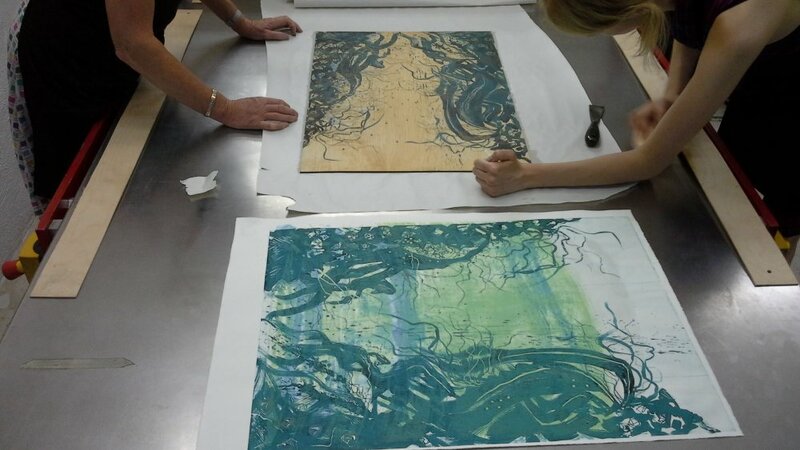 She prints in her own studio in South Brent and teaches at Dartington Print Workshop. Louise gathers ideas and inspiration for her work from walking on Dartmoor and from the South Devon coast where she dives, rows and fishes. She is happiest when she can translate her field sketches into prints. Copper, lino and wood and other materials are used to make plates and she enjoys the endless possibilities of mark making on the surface of the plates and the inevitable excitement of lifting the first print proof off the press - the start of a new edition . . . Some of Louise’s small prints and cards can be bought from this website. The larger works that you can see in the site galleries can be viewed and purchased from (real!) galleries throughout the South West of England. Click the i for links. 51 Fore Street, Totnes, TQ9 5NL. 5 The Devon Guild of Craftsmen, Bovey Tracey. I have started working on a series of images describing the underwater journeys I make. I dive between Plymouth and Dartmouth on the South Devon coast, a beautiful coastline rich in marine and plant life. I come home and make memory sketches of the experience, I also take photographs and videos when I am underwater. 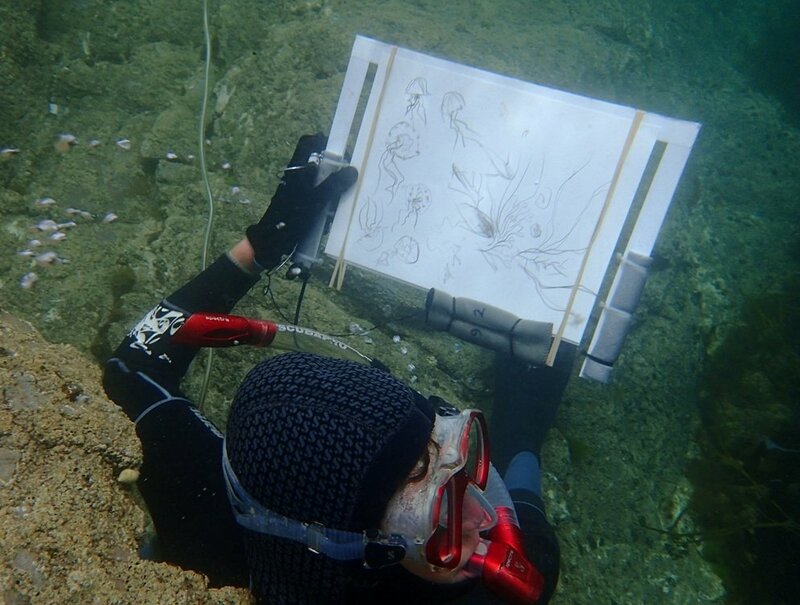 Next year I hope to make sketches during these trips using waterproof materials, it is hard enough to manage all the bits and pieces one needs underwater but not using breathing equipment eliminates some of those problems! I am also working with a Community interest Company called 'Storylines' who gather and share personal stories in creative ways. They are working with South Devon and Channel Shellfishing Association on a project called Guardians of the Reef. They are recording and sharing people's memories and stories relating to shellfishing in South Devon. My book 'Start' - which describes words and practices of local fishermen will be displayed alongside their work this year in various locations in the South West. During the Summer of 2017 Louise travelled to southern Spain to learn the technique of Mokulito from the leading expert Ewa Budka. It has acted as a catalyst for her to embark on an exciting new body of work. 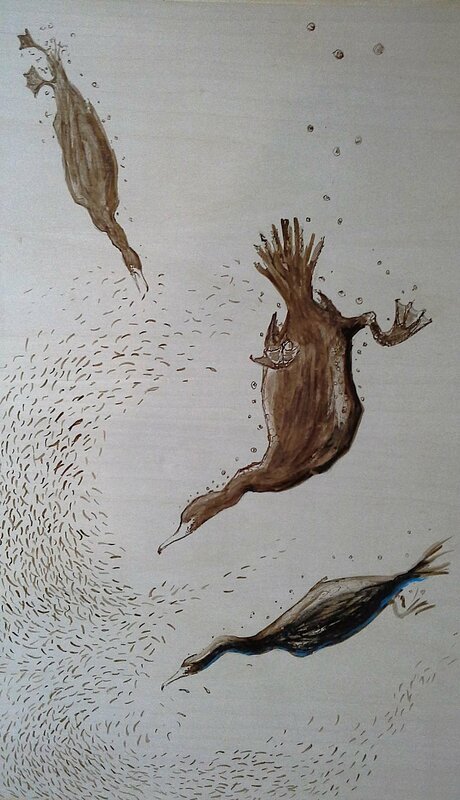 Mokulito is a form of wood lithography using plywood, images can be worked both onto and into the surface of the wood. 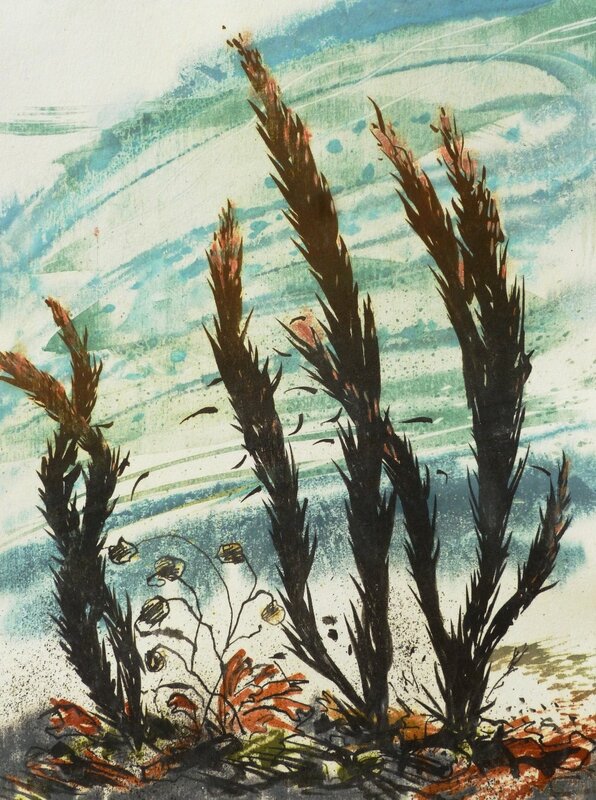 Spending time underwater on the south coast between Plymouth and Dartmouth, she has photographed and sketched images which she is using as inspiration for her printing plates. She will describe an environment - not familiar to everyone - a place where conditions change quite suddenly, where vast shoals can appear and disappear in an instant, where surprises are hidden in rafts of kelp and small exquisite life forms catch the underwater artists discerning eye.